Jared Unzipped: The Curious Case of the Honey Badger. 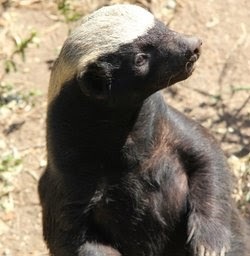 I watched a documentary this evening about nature's most lovable jerk... the Honey Badger. The Honey Badger has no natural predators in the wild. Hyenas, porcupines, snakes, lions, rhinos... they are all afraid of the ferocious creature. Nothing in the wild preys upon the Honey Badger. Yet, it generally can only grow to roughly thirty-five pounds in weight and forty-five inches in length at maximum. The question I'm left to ponder is this -- How does an animal with no known natural predators remain so small in size? The vast majority of creatures with no predators on this planet are much larger. This role is classified as an Apex Predator. As such, the Honey Badger is in league with Kodiak Bears, Killer Whales, Saltwater Crocodiles and the mighty Tyrannosaurus Rex. That's some pretty lethal company to keep, wouldn't you say? Can you imagine all of these animals coming together for a meal? Holy Schnikes! 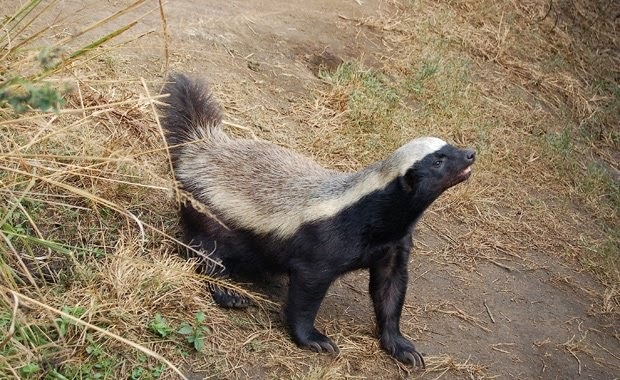 Let's just marvel at how truly wondrous the Honey Badger is. Let's also hope that it never acclimates to North America and completely takes over our continent. There's plenty of easy prey here for the Honey Badger to eat. It'd be like shooting fish in a barrel.